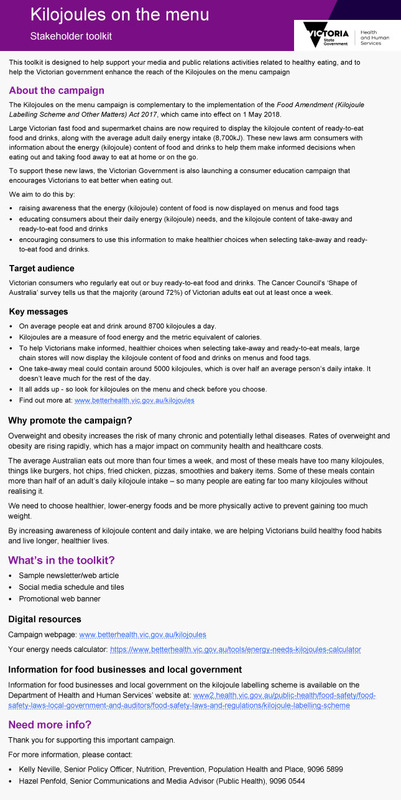 All the material below has been submitted by Dana Thomson, Health Promotion Officer at healthAbility in Eltham and trained public health dietitian. Have you had an allergic reaction to packaged food?. Want to know about digestive health?. New kilojoule labelling laws came into force at the start of May. 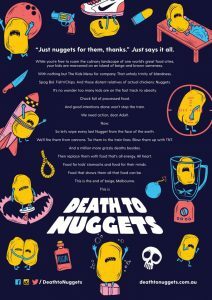 The Department of Health and Human Services has launched a complementary consumer education campaign entitled Kilojoules on the menu: check before you choose. Find out more by reading the picture or by going to the Better Health website. 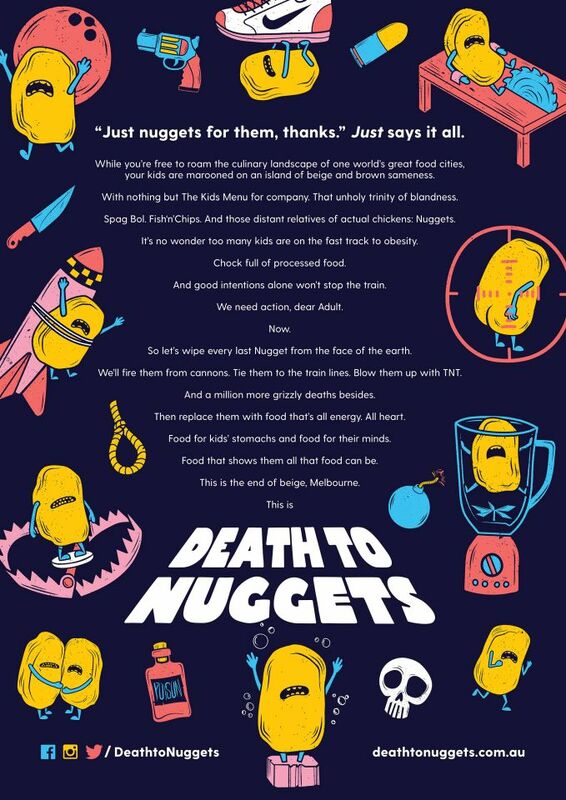 While the name ‘death to nuggets’ may sound a bit extreme, their push for better kids’ menus is much needed, and it’s great to see this being supported by those within the restaurant industry. I [Dana] like how they say ‘Food is a system. If everyone does a little more — whether at home, eating out or in Government — we can improve what kids think is normal’.” See their website and their Facebook page. They are also asking you: to encourage significant numbers of parents to ask eateries for the food they would like to see; and/or to encourage eateries to participate so that they play a positive role. Food labels are required by law to carry essential information so that people know what is in the food they buy. This includes statements about the presence of food allergens, which are foods known to cause a life-threatening reaction (including anaphylaxis) in people with allergies. People with allergies are at serious risk unless foods are labelled correctly. 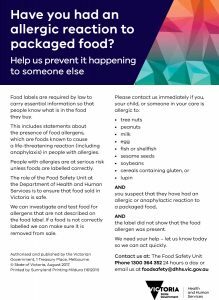 The role of the Food Safety Unit at the Department of Health and Human Services is to ensure that food sold in Victoria is safe. They can investigate and test food for allergens that are not described on the food label. If a food is not correctly labelled, they can make sure it is removed from sale. 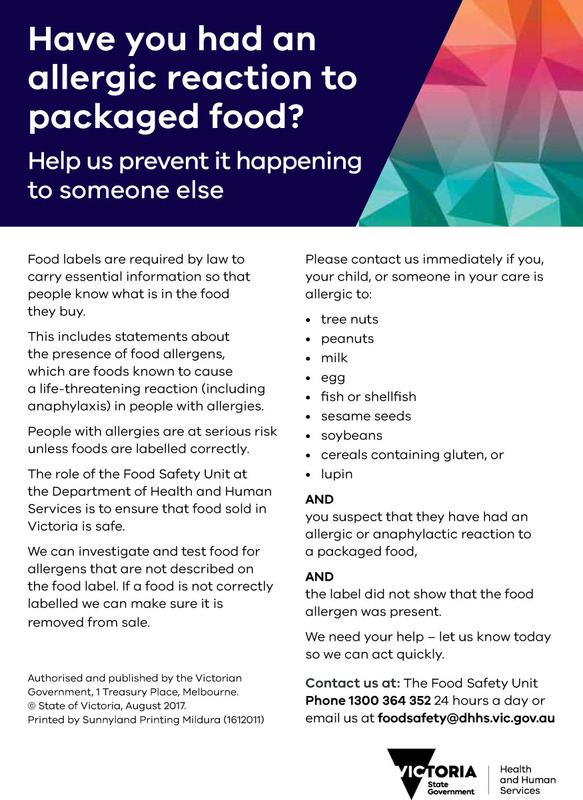 Please contact them by phone (1300 364352 24) or email if you suspect that you have had an allergic or anaphylactic reaction to a packaged food and the label did not show that the food allergen was present. The ‘gut microbiome’ (aka ‘microbiota’) refers to the collection of micro-organisms (including bacteria, archaea, viruses, fungi and unicellular eukaryotes) that live in our gastrointestinal tract (or gut). Probiotics are ‘good’ bacteria or yeasts that, when taken in adequate amounts, can improve the balance of the gut microbiome. Research suggests that most health-related effects are strain-specific. Probiotics are found in yoghurt, kefir (a milk drink) and other fermented foods (e.g. kombucha, kimchi, miso, tempeh, sauerkraut and sourdough bread). Aussie favourites: baked beans, instant noodles, etc. 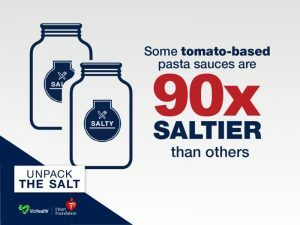 Read the labels – (and look out for ‘no salt’, ‘low salt’ or ‘reduced salt’). 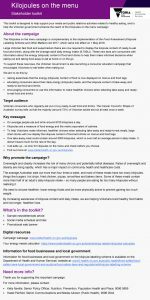 Choose the right packaged food – e.g. frozen are lower salt than canned. Stop adding salt at the dinner table. Eat fresh – fresh fruit and veg are naturally low in salt. As discussed in a flyer entitled Get the facts: the role of sodium in your food, sodium plays many roles in our foods, mainly to enhance flavour, to preserve freshness and to improve texture/appearance. Excessive salt intake can be directly linked to high blood pressure, which increases the risk of stroke, heart and kidney disease. Victorians consume almost double the maximum daily salt intake of five grams recommended by the World Health Organization (WHO). Victorian children eat about 30% more salt than recommended. Around 75% of salt in our diets comes from processed foods like cooking sauces, processed meats and ready meals. Stroke, heart and kidney disease caused by excess salt is preventable. New research has found convenient cooking sauces to be packed with salt. 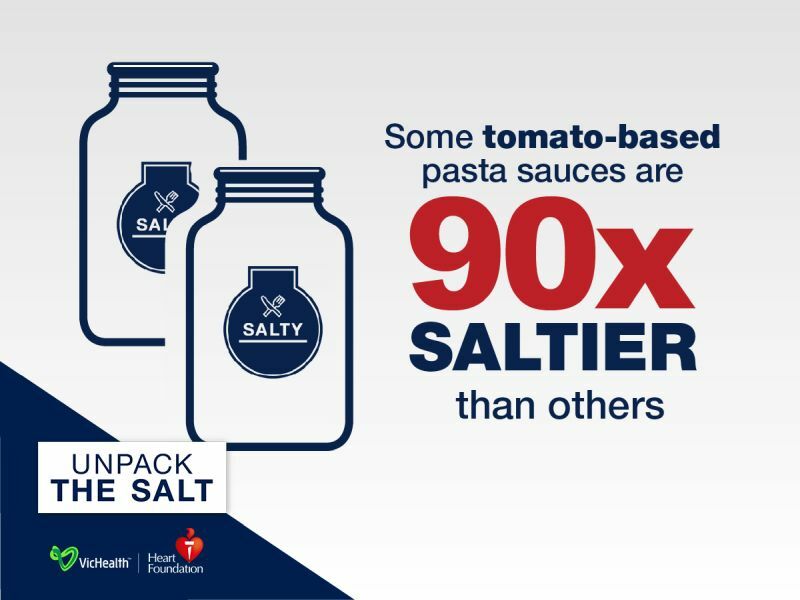 For example, a fresh pasta sauce from the supermarket can contain almost 1/3 of your daily maximum salt intake, with some tomato-based pasta sauces containing 90 times more salt than others. Health Star Ratings are a front-of-pack labelling system intended for processed foods only, not fresh wholefoods. Hopefully you don’t eat too much processed food. But many people do. Did you know that we spend almost 60% of our budgets on ‘discretionary foods’, which are typically heavily processed? These foods also make up 35% of our total food intake in terms of energy. The Health Star Ratings may help you choose healthier options. Products are assigned a rating from ½ a star to 5 stars. Currently, you can only compare within food categories. The calculations are different depending on the category you choose. For example, you can’t compare a dairy product rating with a breakfast cereal rating. 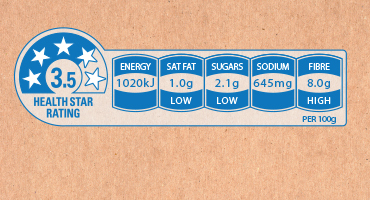 The ratings are currently optional for food manufacturers to include on their labels. Many in the food industry are not opting in to this scheme if their products score poorly. However, you can download the Food Switch App (Android, iOS) and scan almost any product to obtain its rating. Use the ratings in conjunction with other food information like dietary guidelines, the ingredients list, and the nutrition information panel. If you would like to learn more, healthAbility also runs supermarket tours to help people make sense of food labels. The system is currently under a 5 year review and taking public submissions. If you would like help writing a submission, Email Dana. For more information: read the government website; watch this video; read this blog; or read this critique. Good work. It is hard to buy tins of beans, chick peas, lentils etc without salt (or sugar) though it is possible. Our solution is to rinse the contents vigorously before using. Do you think this helps cut down on the salt? Tomato paste and tomato sauce is also tricky, though you can buy salt-less varieties. Great solution, Meg. Yes, draining and rinsing tinned food well under water is also noted in the tips section on the website http://www.unpackthesalt.com.au.